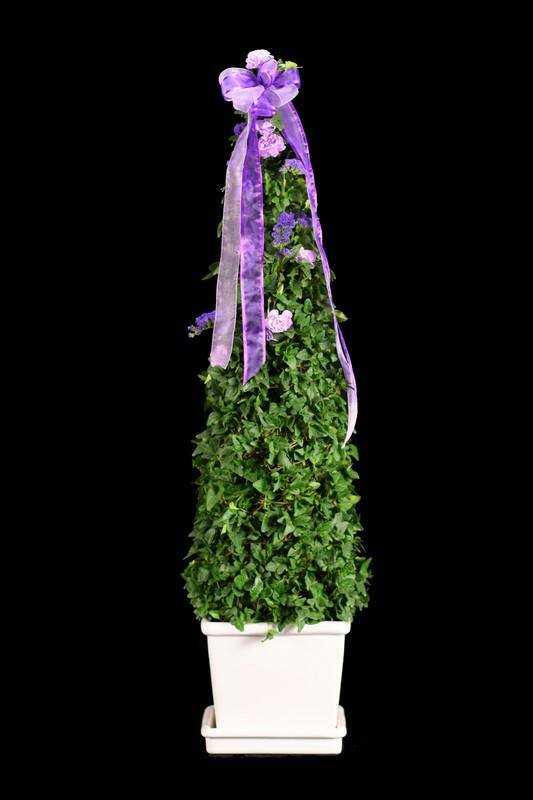 Beautiful and serene, this ivy live topiary plant is a part of a greenery tradition that dates back to Roman times. Whimsical and verdant, live topiary trees are a gorgeous addition to any household. Fresh topiary plants can be placed indoors or left outside during the summer months. Since it only withstands a certain range of temperatures, it should only be placed outside during milder weather. For it to grow its best, this plant should live in a temperature range of 40° to 80° F. Weighing 6.5 pounds, the fresh topiary plant grows in an eight inch pot. Between watering, the soil should be allowed to get completely dry. These plants do not withstand excessive sunlight, so they should be placed in a bright location that enjoys indirect light from the sun. One of the first recorded uses of live topiary trees was in Pliny's Natural History. During the era of the Roman empire, topiary trees were grown within Roman gardens. They were shaped into people, animals, shapes and obelisks in the homes of the region's most luxurious villas. Around the same time period, topiary trees and bonsai plants were shaped carefully within China and Japan. The shrubs and trees were clipped into curved shapes or placed within rock gardens. In the Japanese tradition of cloud-pruning, the topiary trees were clipped so that they resembled the clouds in the sky. After a snowfall, these beautiful plants were considered exceptionally beautiful to look at. After their ancient beginnings, fresh topiary plants fell out of favor until the Renaissance age. During this time, the topiaries could be spotted in the gardens of the European elite. Like previous eras, the topiaries were cut and shaped to resemble a variety of different shapes. The Renaissance era also saw the rise in popularity of topiary shapes that resembled people or animals. Although the topiary plant's popularity declined during the 1700s, it suddenly enjoyed a revival in the 1800s. It was used to make garden “rooms” and was exhibited at locations like Elyaston Castle. The topiary was quickly adopted across the country as a way to make architectural designs and rooms outdoors. Over the next few decades, the shaping of topiaries into animals, people or shapes began to experience a revival as well. Since the 1800s, topiary plants have remained a fixture of indoor and outdoor living spaces. .
Care Instructions: Let soil approach dryness between watering. Do not let roots sit in water.. Exposure: Bright, indirect light., Indoor Temp: 40 - 80?F, Weight: 6.5 lb, Pot Size: 8 inches, Height:6.5 lb. Learn more on caring for your topiary. Giving 5 starts for this purchase. This topiary looks great in my garden.